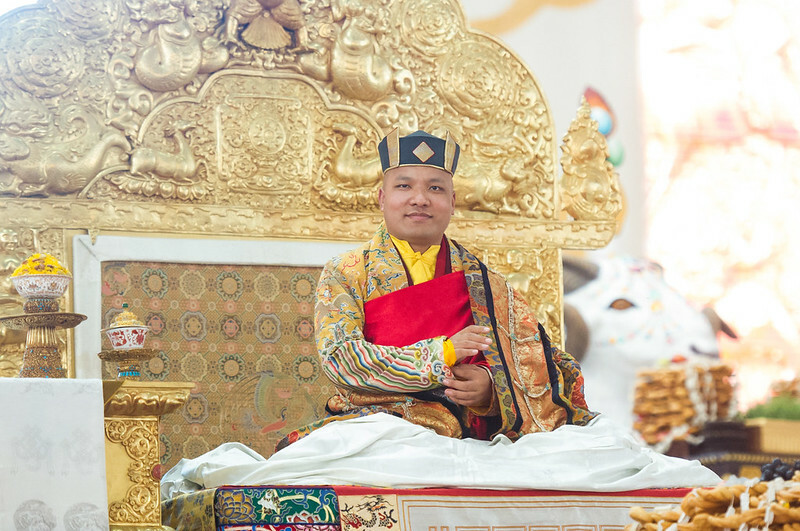 On the second day of Losar, His Holiness the Gyalwang Karmapa acknowledged all those who share the responsibility, happiness and burden of his Office of Administration, the Tsurphu Labrang, and those who work in organising the extensive Kagyu Monlam. This ceremony, known also as the Row Ceremony because everyone is seated in rows in front of the Karmapa, was a part of the Tsurphu Monastery Losar tradition. 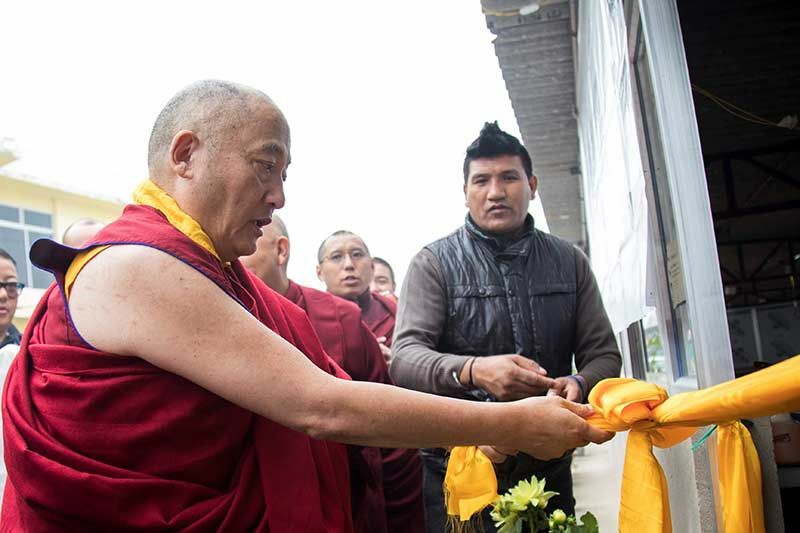 It was a blend of a lavish Tibetan style banquet and a carefully executed monastic ceremony. On the screen, the sky with rushing clouds covered the main wall, creating an impression that this great gathering was being held under the open skies of Tibet and a huge white decorated ram’s head placed in the center, signified auspiciousness for the next year. The decoration of the Pavilion was much simpler as the focus shifted to the performances on the stage where rows of traditional benches were set up, like an unfolded fan, for the staff to be seated. His Holiness the Gyalwang Karmapa was seated in the center of the stage, beside him sat H.E. Goshir Gyaltsap Rinpoche. To the left of the stage sat the senior lay staff of the labrang and the Monlam, extending into the left wing with the remaining permanent lay Monlam staff. Rinpoches, tulkus and khenpos sat on the right side of the stage; behind them, the high-ranking monks from different monasteries sat on the tiers of the right wing. His Holiness had requested all international staff to wear traditional dress from their own countries, in acknowledgement of the diversity of their cultures. All staff were seated at small tables laden with abundant offerings of kapsey and sweets, placed alongside unusually large tea bowls which had to be lifted using both hands. The auspicious tea ceremony started when a row of monks in red and gold appeared with large, intricately decorated wooden jugs from which they poured tea into the comically large tea bowls. 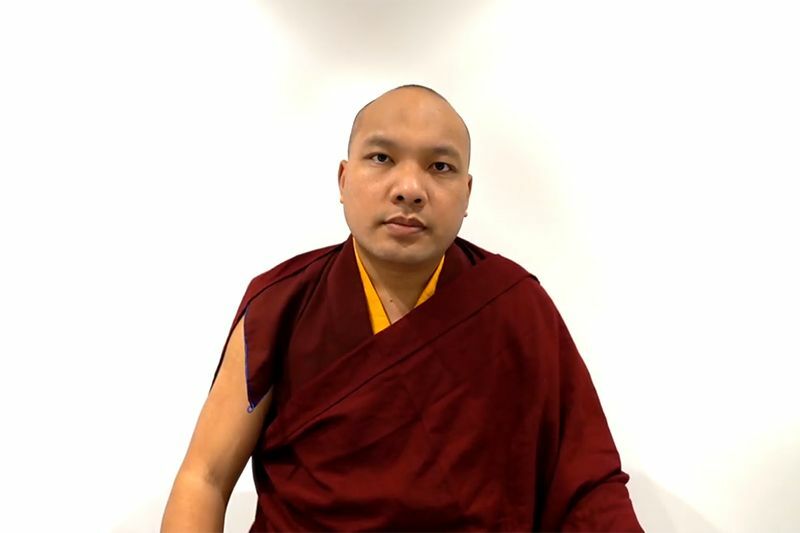 A wave of laughter broke out throughout the Pavilion as Bokar Rinpoche Yangsi drank from the bowl, disappearing entirely behind it, only his small hands showing. Next came a musical item. A group of Umzes [chant masters] from different Kagyu monasteries opened the chanting, and this chant was then taken up by a combined choir of monks from Thrangu Monastery Namo Buddha in Nepal and nuns from Palmo Chökyi Dingkhang, who have been undergoing special training in three-part harmony under Khenpo David Karma Choephel. Following them, members of the Tibetan Institute of Performing Arts offered a beautiful sword dance. The next session was a spirited traditional Dharma discussion reprising a debate held at Dege. They discussed the spreading of Buddhism in India and Tibet in loud voices following the traditional style. The Umzes returned to the stage and continued with their harmonious chanting. As before, the choir of monks and nuns then took over. 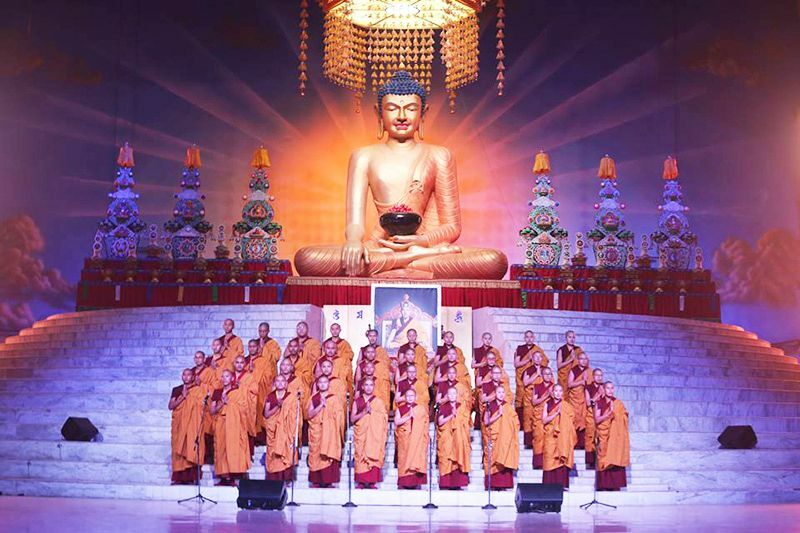 The performance ended with “Three Men from Kham”, a song about the three special students of Gampopa named Dorgyal, Shogom, and Use (another name of Dusum Khyenpa, the First Karmapa). Then came turn for monks to debate. 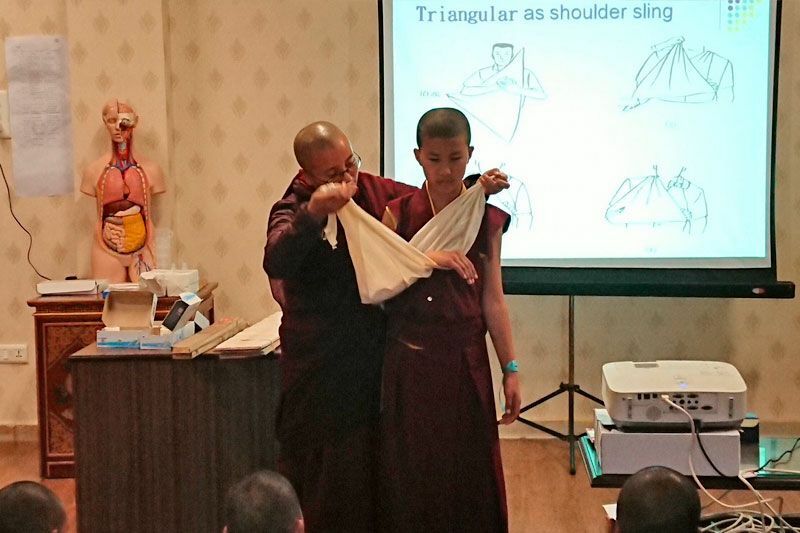 Now, the professional debaters, monks from Sherabling Monastery and Bokar Shedra, held a traditional style debate about generating bodhicitta. 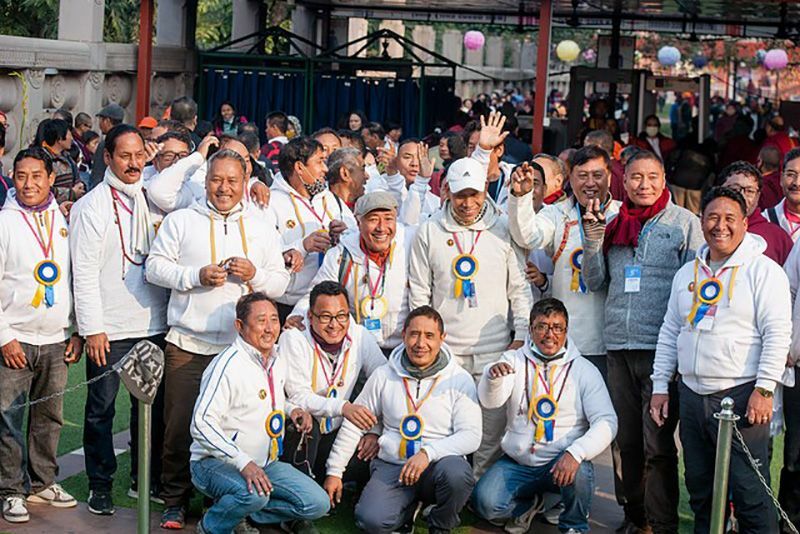 Following the prayers for the long life of the masters and aspirations for well-being and auspiciousness, the entire ceremony came to an end with yet another tradition —packing huge amounts of kapsey for each member of the staff. After that, everyone dispersed to get ready for the exciting celebrations and ceremonies which would follow on the next three evenings.